Nancy Roberta Nalepa, age 87. February 1, 2019. Loving wife of Joseph for 57 years, who preceded her in death. Beloved mother of Kathy (the late David) MacDonald, Judith (Mike) Uyttendaele, Tere (Mark) Ryan, Michael (Kathie) Nalepa, and Nancy (Joe) Kerr. Dear grandmother of Erica Canavan; Douglas, Austin, and Bradley Ryan; Andrew, Patrick, and Clare Nalepa; Joseph (Maureen) and Graceson Kerr. Dear great-grandmother of John Paul, Julia, and Sebastian Kerr. 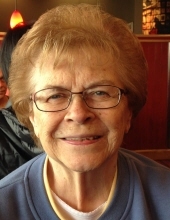 She belonged to St. Albert the Great Parish for over 56 years. Nancy retired from Michigan Bell Telephone Company in 1994. Visitation will be held at Lynch & Sons Funeral Home, 340 N. Pontiac Trail (3 blocks south of Maple Road) in Walled Lake. Visitation will be Sunday from 12-5 p.m., with the Rosary at 4 p.m. Instate, Monday at St. William Parish, 531 Common Street Walled Lake, MI 48390 9:30 a.m. until the time of Mass at 10:00 a.m. Memorial contributions may be made to Everest Academy 5935 Clarkston Road, Clarkston, MI 48348. "Email Address" would like to share the life celebration of Nancy Roberta Nalepa. Click on the "link" to go to share a favorite memory or leave a condolence message for the family.